Stephen Curry walks off the court at the start of the third period in Sunday's Warriors win over Houston. HOUSTON -- Stephen Curry will miss at least two weeks for Golden State with a sprained ligament in his right knee, dealing a blow to the Warriors' hopes of following a record-breaking season with a second straight championship. The Warriors said an MRI on Curry's knee Monday determined he had a Grade 1 sprain of the MCL and will be re-evaluated in two weeks. That timetable would lead to Curry missing the rest of the first round of the playoffs and likely at least the first four games in round two if the Warriors are able to advance. Golden State leads Houston 3-1 in its first-round series. Game 5 is Wednesday night in Oakland. Curry was injured on the final play of the first half of Sunday's 121-94 win in Houston when he slid awkwardly on a wet spot on the court and fell. He immediately grabbed his knee and jogged with a limp to the locker room. He came out with the team after halftime, but sat on the bench for most of the warmup time. After talking with coaches, he returned to the locker room with his second injury of the series. Curry had missed the previous two games with a sprained right ankle. The Warriors thrived without Curry on Sunday, hitting eight 3-pointers in the third quarter alone to turn a tie game into a 21-point lead on the way to the easy win. But doing that without the reigning MVP for a longer period of time figures to be more problematic. The Warriors have gone 3-2 this season without Curry playing, including wins against the Rockets on New Year's Eve and at home in Game 2. 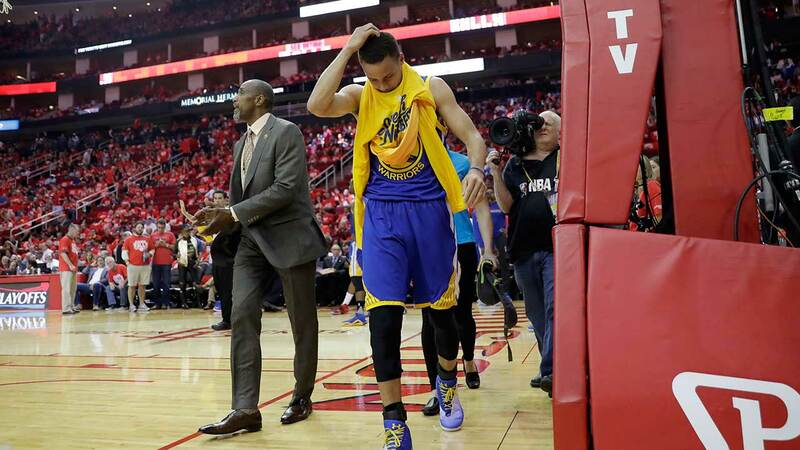 Golden State also lost Game 3 in Houston by one point while Curry sat with the ankle injury. Replacing everything Curry does is almost impossible because no one has ever had the collection of skills he has with the ability to spread the defense with long-range shooting, the ballhandling to create his own shot and the playmaking that leads to easy baskets for his teammates. Curry led the NBA this season by averaging 30.1 points per game, while averaging 6.7 assists, 5.4 rebounds and a league-leading 2.1 steals as well. Curry made a record 402 3-pointers, eclipsing his own previous mark by 116. While backup point guard Shaun Livingston and do-everything power forward Draymond Green can shoulder much of the playmaking load and Klay Thompson is the second-best 3-point shooter in the league, the Warriors go from a historically great team that won a record 73 games in the regular season with Curry in the lineup to a vulnerable one if he misses significant time. With a 3-1 series lead and two potential games at home against the eighth-seeded Rockets, Golden State is still primed to advance to the second round without Curry. But a second-round series against either the Los Angeles Clippers or Portland would be much more problematic. The second round of the playoffs won't start until this weekend at the earliest. No matter when the second round starts, Game 4 would likely be either May 8 or 9, which will be in two weeks. That would make Curry's earliest possible return in Game 5 but Golden State could be forced to go the entire round without him, which could open a path for teams like San Antonio, Oklahoma City, the Clippers or Cleveland to win the title. The Warriors benefited from injuries to opponents last season on the way to the NBA title with Memphis point guard Mike Conley missing time in the second round and Cleveland missing point guard Kyrie Irving for the last five games and power forward Kevin Love for the entire NBA Finals. This would not be the first time a playoff injury potentially derailed a historic run. In 1972-73, the Celtics won 68 games in the regular season but star forward John Havlicek injured his right shoulder in Game 4 of the Eastern Conference finals against the New York Knicks. Havlicek missed one game and played hurt in the final three as New York won the series in seven games. The Los Angeles Lakers rolled through the 1989 playoffs with 11 straight wins to get to the Finals as they sought a third straight title. Byron Scott pulled his hamstring before Game 1 and missed the entire series against Detroit and Magic Johnson then injured his hamstring with the Lakers leading in the second half of Game 2. The Pistons came back to win that game and sweep the series against the short-handed Lakers. Just four years ago, the Chicago Bulls tied for the best record in the NBA in the lockout-shortened regular season only to lose point guard Derrick Rose to a torn ACL in Game 1 of the playoffs against Philadelphia. The Bulls lost the series in six games.